The Hainworth is a real step forward in recliner armchairs. Made from real leather, the Hainworth has superb built in heat and massage functions that are normally found only in much more expensive chairs. Normally, when buying a dual motor recliner chair with massage and heat you would be looking upwards of £1,000. The chair we tried was very easy to put together and was delivered in just a couple of days. The dual motor function means that the footrest and headrest can be operated seperately. When ordering, you will have the choice of three beautiful colours that just add more desirability to this recliner chair with heat. On either side of the recliner armchair, you will find two handy storage pockets for keeping your remote control, the newspaper and anything else you want to keep handy. The chair will arrive in a very, very large single cardboard box. Unless you live in a barn, it will be impossible to get through your front door without first removing it from the box. As with all recliner chairs, the base is the heaviest part and you will need another person to help you carry it to your living room. The powerful motor inside works reliably and quietly and we are confident that it will give you no problems and should last a number of years. Some customers have commented that the footrest does not raise as high as some other recliner chairs that are available, however we actually found this to be a positive. On some chairs, having the footrest too high can be uncomfortable and cause lower back pain. The Hainworth dual motor recliner chair with heat is supplied with an easy to use remote that will be suitable for all people including those with dexterity or memory problems. The maximum user weight of this chair is 18st. 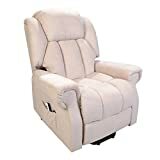 Overall this is an excellent chair and sets a new standard in recliner chairs. Where to buy the Hainworth recliner armchair? We recommend taking a look at our list of the best recliner chairs. Heat is one of the main treatments for arthritis. I also agree with you that this is a great price for a chair so rich in features. An excellent electric recliner chair. The heat and massage functions for me are an added bonus because on its own with the quality of the fabric it is worth the money. The dual motor seems a lot more powerful than my last chair. Totally agree Bill, thanks for your comment. I commented in the review on the power of the motor. The hainworth should last you a long time.